Two new surveys conducted by or on behalf of West have revealed that patient satisfaction ratings are deeply intertwined with the financial well-being of a hospital or health system. This is primarily due to two factors: New reimbursement models tied to satisfaction ratings and increased consumer choice. According to the Centers for Medicare & Medicaid Services (CMS), $1.5 billion in value-based incentive payments were up for grabs for hospitals in 2016. With reimbursements at stake, hospitals are working harder than ever to provide exceptional patient experiences and earn high marks on the Hospital Consumer Assessment of Healthcare Providers and Systems (HCAHPS) survey. HCAHPS surveys cover topics like communication with doctors, the responsiveness of hospital staff, and transition of care, and a poor performance will result in negative Medicare payment adjustments. Furthermore, a recent report by the Deloitte Center for Health Solutions states that HCAHPS scores are directly related to a hospital’s profitability. Their analysis revealed that hospitals with “excellent” HCAHPS patient ratings between 2008 and 2014 had an average net margin of 4.7%, as compared to just 1.8% for those with “low” ratings. In today’s consumer-driven society, patients know that they have options. 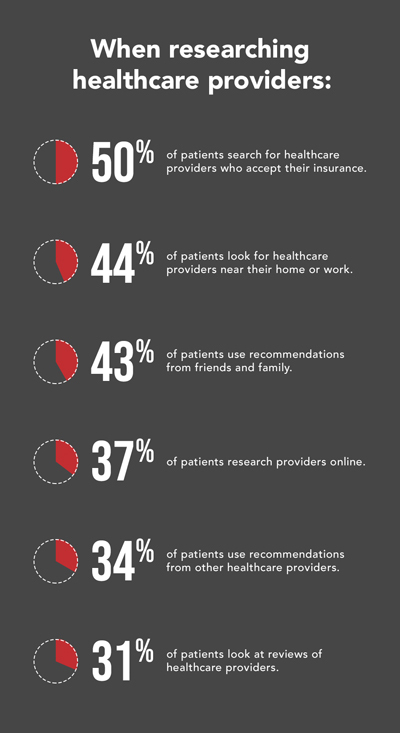 More than half (59%) of people surveyed admit that they diligently research healthcare providers before choosing one. They look for physicians who accept their insurance and are located near their home or work and they take reviews and recommendations into account as well. In addition to putting more thought into selecting a physician, patients are more likely than ever to opt for a different provider if they are not fully satisfied with the care they receive. In fact, 91% of survey respondents said they would look for other physician options if they are not completely satisfied with the care they receive. As the emphasis on patient satisfaction continues to grow, so will the impact it has on a hospital’s bottom line. Beyond expanding and improving service offerings, taking steps to understand what will keep your patients coming in the door can help ensure the long-term stability of your institution.